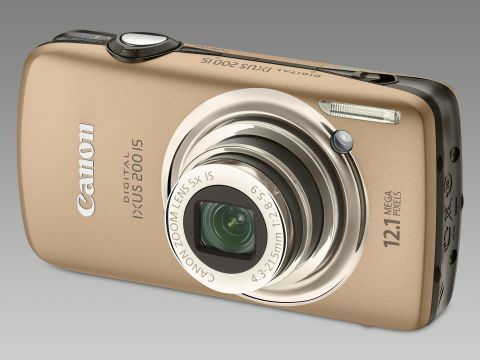 The Canon IXUS 200 IS is the latest touchscreen compact camera to come from the industry leader. Canon has never had much trouble getting its range of IXUS compact cameras noticed: it has historically been among the best-looking, best-performing you can get, and the Canon IXUS 200 IS adds another string to a formidable bow. The screen on the back isn't only one of the largest TFTs you'll find on a compact, but the bright 3-inch widescreen monitor is a touchscreen, the first to feature on a Canon compact. It sits near the top of the IXUS range – below cameras such as the IXUS 980 and 990, but its 12.1 megapixel (MP) sensor raises it above the crowd. The headline touchscreen doesn't mean you get a reduction in the number of buttons on the back, as you can only perform a few tasks via the screen. Still, using the touchscreen is satisfying. For instance, with the IXUS 200 in still mode, you can tap an object that you want to expose for and focus on, and the camera will track it, missile lock-on style. It's handy if you're taking a picture of a moving person, or from a vehicle, although we found that the detection was interrupted if the tracked object moved very quickly, so it's unlikely to be a godsend for motorsport buffs. Otherwise the touchscreen only does a few jobs.